Sola Sisters: Is Rob Bell A Universalist? Yes and No. Rob Bell, creator of NOOMA videos and author of "Velvet Elvis" and the newly released "Love Wins," recently released a video discussing his controversial new book. This video has gotten everybody talking because, from the statements made in the video, it appears that Rob Bell might actually be a Universalist. So the question has been raging: is he or isn't he? How can this be? How can somebody who is a Universalist make such statements? Well, this should come as no surprise, because as we have written before, we fully expected Bell to affirm Christian concepts in this book because he is the particular kind of Universalist mentioned above: he is a Universal Reconciliationist (and please note that Universal Reconciliation is also sometimes called "Christian Universalism"). Universal Reconciliationists often use Christian terminology and claim to hold to certain Christian concepts (like Jesus, Hell, the Atonement, the Cross, etc.). Let me repeat that: There is a stream of Universalism (again, called "Universal Reconciliation," but sometimes called "Christian Universalism") that teaches Jesus, Hell, the Atonement, and the Cross. Yes, really. How can they teach such Christian concepts? This is how: all of these concepts have redefined meanings. UNIVERSAL RECONCILIATION (a.ka., CHRISTIAN UNIVERSALISM): ALL people are ultimately saved through Christ. They may not have a complete understanding of who Christ is, but in some way, the suffering and crucifixion of Jesus Christ constitutes the mechanism that provides redemption for all humanity and makes atonement for all sins. A limited form of hell is sometimes held to, but not always. My friends, this really does matter because if we try to contend for truth on this issue in the same way we would contend against Universalism (i.e., quote scripture affirming Jesus, Hell, the Atonement, the Cross, etc. 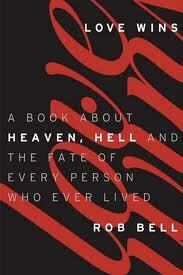 ), we're going to get head-pats and chuckles from the more "enlightened" Rob Bell followers. I went on Rob Bell's FB page a few nights ago, and saw a number of sincere and earnest Christians trying to contend with Bell's followers about the issue of Universalism. I could see that the Christians were truly stumped. And they would try again: "Jesus is the only way anyone can be saved!" And Bell's followers would answer back - "We believe that too!" And away they would go. These earnest contenders, you see, have been reading the glut of articles stating that Rob Bell is a Universalist without understanding that Bell is a Universal Reconciliationist, and he therefore does affirm there is a Hell (though in his view it is a temporary, purgatorial version of "hell"), and he does affirm Jesus and the Cross (but only in the sense that he believes ALL are saved through Jesus' death on the Cross). Understanding these distinctions is crucial if we are to plead this point with any hope of exposing Bell's dangerous heresy. When we call Bell a Universalist without making the distinction that he is a Reconciliationist, and attempt to argue that he is denying there is a Hell (he isn't), and that he doesn't believe Jesus died for sins on the Cross (he does), then we will be hamstrung in this debate. And for the sake of our Christian children - who, trust me, are very familiar with who Rob Bell is - it really, really does matter that we understand this distinction.